Defence Minister A K Antony, the official No. 2 in the government and the “political Guru” of Congress Vice-President Rahul Gandhi, is also making the right moves. 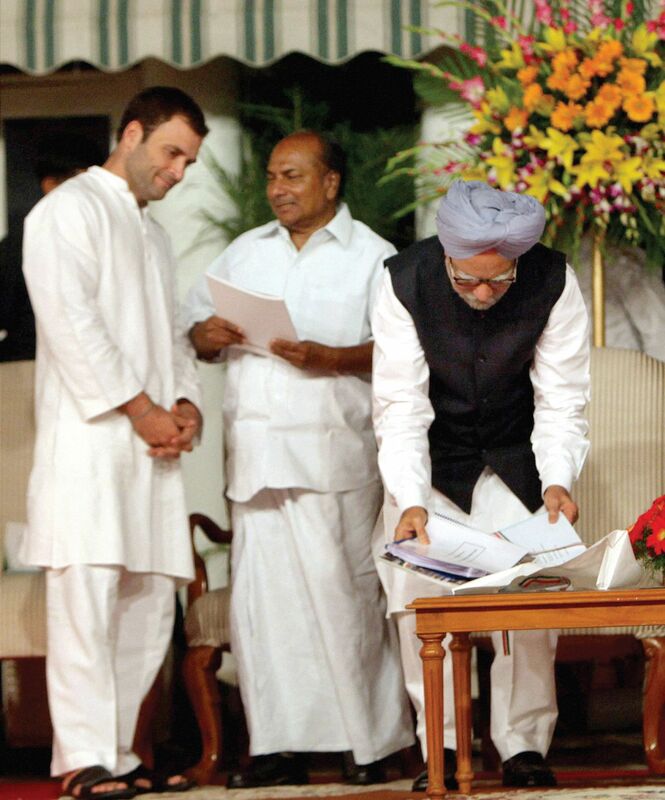 Manmohan Singh may have filed nomination for yet another Rajya Sabha term hoping for a hat-trick as prime minister in case the Congress gets a majority in 2014 elections but Defence Minister A K Antony, the official No. 2 in the government and the “political Guru” of Congress Vice-President Rahul Gandhi, is also making the right moves. Antony, whom Sonia Gandhi and Rahul trust absolutely in all political matters, is meeting the right people at the right time and is playing the trump card of being “Mr Clean” quite well. His manoeuvrings, quite in tune with his personality, are subdued and low profile. Last week, the defence minister met a CPI(M) Politburo member at the latter’s place and talked politics at length. “The Politburo member had come to attend the Central Committee meeting and wanted to meet Antony. But quite surprisingly when he asked for an appointment, Antony said he will come to our place and meet,” said a source. The two held closed-door discussions for about an hour and during that meeting, Antony repeatedly talked about the importance of the Congress and Left joining hands once again like the UPA I. Left supporting the Congress from outside in the eventuality of UPA failing to cross the 200 mark serves the interest of not just the party but Antony too. “It is quite possible that Left may support the Congress to keep away the BJP. But one thing is for sure that the government will not be headed by Manmohan Singh,” said the CPI(M) leader. According to him, Left parties, especially CPI(M) General Secretary Prakash Karat, no longer trust Manmohan Singh, post the Indo-US nuclear deal, signed during the UPA I after which the Left had withdrawn its support. “Sonia Gandhi is clever enough to understand that if it needs the support of Left, the Congress should have someone clean like Antony at its helm,” said the CPI(M) leader. Another clever move that Antony made last week was his unusual intervention in Kerala politics where he endorsed state Congress President Ramesh Chennithala, an upper caste Hindu, for the home minister portfolio. This unusual interest in getting Chennithala into the UDF Government is not just for settling scores with Kerala Chief Minister Oommen Chandy, his one-time close friend, but also to win the majority community sentiment. Antony is quite aware of the fact that his ‘Christian’ identity is all likely to work against him though he is not a practicing Christian and has never gone for any Christian religious functions. But knowing well that Sonia may find it tough to appoint a Christian as the PM, Antony has to work on that front too. “He is more Hindu than any Hindu Congress leader and he has the support of all Hindu groups in Kerala and his open support to Chennithala is quite tactical,” said an Antony loyalist from the state. He also recalled Antony’s controversial take on the increasing clout of minority communities where he had accused Kerala’s minority communities of “cornering undue benefits through political arm-twisting”. Many view his carefully “cultivated” proximity to Mata Amritanandamayi Devi as a clever strategy to undo any harm that his Christian name may incur. “Antony will never go to a church but for his mother’s death anniversary. But he will see to it that he makes public visits whenever Mata Amritanandamayi comes to Delhi,” said a source. And that these efforts are paying well is reflected in the statements made by people like BJP ideologue Govindacharya who had said that Antony is one of the most “suitable PM candidates”. But it is a fact that Antony is viewed suspiciously by Muslim community. Equally he does not have the trust of the industrial lobby as he is not known as man of action. Antony knows it too well that his “Mr Clean” image is his best bet. “When the Congress is being attacked from all sides on corruption charges, it needs to project a clean face if it has to win the trust of the people. The very fact that every other minister in this UPA government is involved in once scam or the other only makes Antony’s chances better,” said a CPI leader who had met Antony recently. Along with this clean image, what works in his favour is the fact that the Gandhi family trusts him absolutely. “Both Mrs Gandhi and Rahul Gandhi trust him absolutely. They know that Antony will not play politics with them unlike the other possible PM candidates like P Chidambaram,” said a Sonia aide. According to the aide, only Antony, apart from Ahmed Patel, was aware of the decision to make Rahul Gandhi the vice president. “No other Congress leader had any idea,” said the source. According to him, it is not for nothing that Rahul called him his “political guru”. “Rahul, just like his mother, trusts him completely. All he needs to do is keep up his image of being “clean face” and keep an eye on his minority identity,” he said. He insisted that Manmohan’s third term hope is a gone forever especially after the infamous exit of Pawan Kumar Bansal and Ashwani Kumar from the Union Cabinet.